We’ve seen numerous reports of the remarkable growth of the Book A Zine category since the beginning of this no longer new decade. Most of the reports marvel at the tremendous elasticity of the category, the unit sales growth and the wide variety of titles that publishers are pumping out. 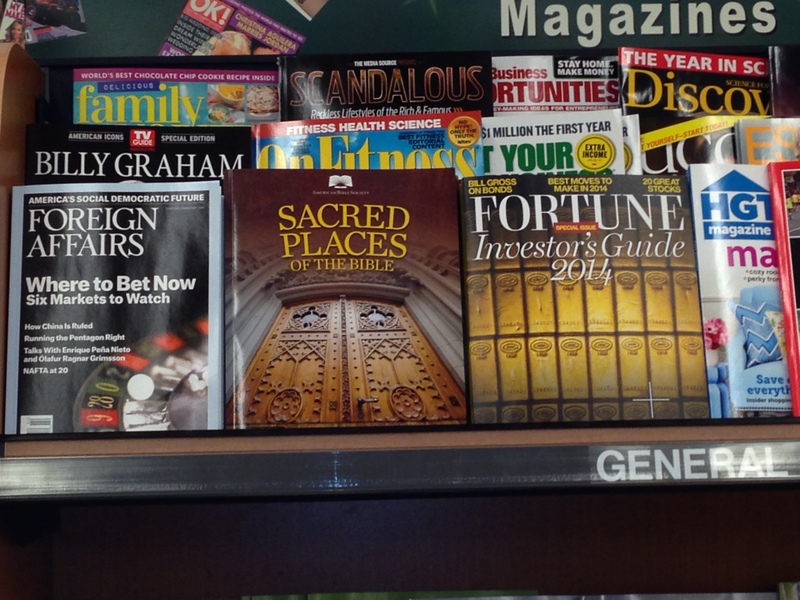 But unless you really go and look at a magazine rack today, you wouldn’t really see and feel the impact of what this “new” category is doing to the rack. * Oh you can talk about it and read all about it, but until you really go and look and see, you might not understand it. When there were more wholesalers to visit, distributions to work and territories to see, I always made it a point to spend a few hours at retail. Unlike some of the traveling pooh-bahs of the time, my goal wasn’t to find an issue to use as a cudgel on the local rep. I really wanted to see and know the town. It was the only way I felt that I could know, understand and own what I was working on. The only way to know what I knew and know that I didn’t know what I didn’t know. If you know what I mean. Because otherwise it was just a bunch of numbers. We don’t have that today. When was the last time someone other than the local merchandiser was in the Martin’s on Route 20 in South Bend, IN? The other day I spent some time getting acquainted with a new supermarket in the wake of my neighborhood store closing. While I still go out to retail, these days I’m usually just looking for one or two client titles. It was good to really stop, look, absorb, and spend time at the rack. It’s a great way to learn a store. Who said “General Interest” is dead? Cooking, cowboys…and ice fishing? Well, it is January, this is the Midwest. Maybe there was nowhere else to drop the bridal mag? While this part of the market is doing well, they can strain the distribution chain. If the store is part of chain that has “SBT” (Scan Based Trading), then the wholesaler owns that merchandise. These are annuals. Those are high cover prices and a long on sale. That’s a lot of inventory to own. There are fewer turns on the rack unless the publisher is pumping out a bunch of ‘Zines. And while some publishers are (cough, cough) pumping out a ton of ‘zines, it’s not enough to replace the lost sales we see in the higher volume categories. Lastly, not all magazine categories are naturals for these “Zines.” And, more importantly, there are some economic issues to be concerned with. Without some existing clout behind you, a brand that is well established and has a significant newsstand presence, these aren’t that cheap to produce nor are they that cheap to launch in the blind. In the comments section of Dead Tree Edition’s post about Book A Zines, industry guru Bo Sacks wondered if we would get too greedy and kill the category. I’m inclined to think not. Unlike a regular frequency title, you don’t repeat a special edition if it doesn’t work. It’s just too costly. Unlike a monthly, you’re not going to leave it on life support because there’s no ad or subscriber revenue to prop it up. Where will the category go? I don’t know. But it was nice to stop and look, really look at the rack. *For the record, back in the day, we called them annuals or SIPS. There just weren’t as many of them, and they didn’t have good press. Editor’s Note: Over the holiday break, I spent a few millennia sitting on a plane reading articles about the Tea Party and looking at photos of some of their paraphernalia. 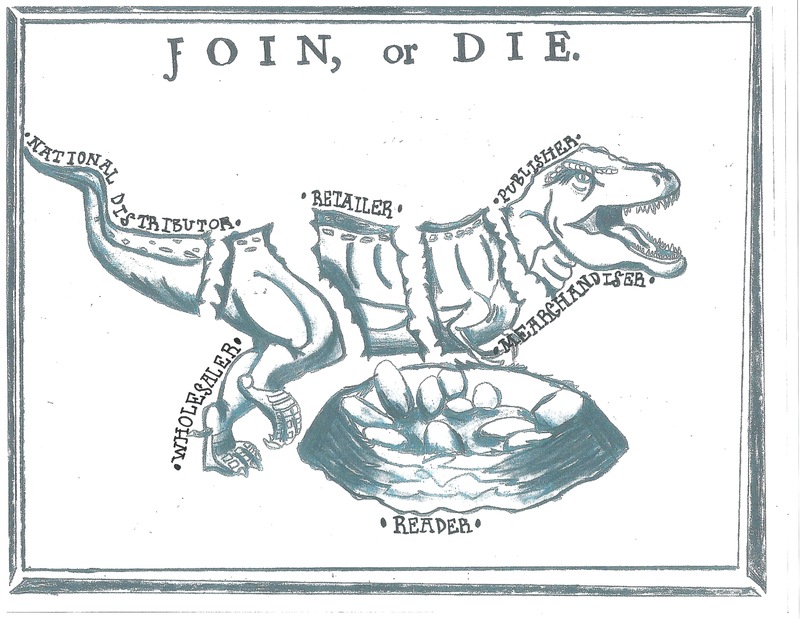 While you don’t want my opinion about the current state of their union, the images they used, especially the “Join, Or Die” flag, got me contemplating Walter Issacson’s excellent biography, “Benjamin Franklin-An American Life”. Somehow, that led me to this image which I offer to you readers. There are enough writers now who scoff at the notion of print magazines going the way of the dinosaur that we can drop the whole “going the way of the dinosaur” or “buggy whip” analogy. In any event, while there are no dinosaurs around these days, they are a pretty big business. And, while there aren’t too many horse drawn carriages rolling around major American cities, there are still buggy whip manufacturers. 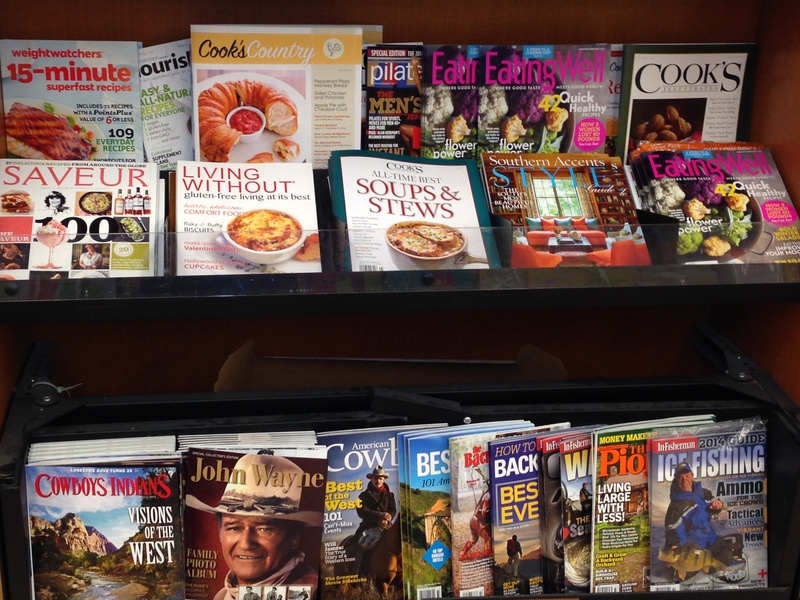 The current state of the newsstand distribution business is an altogether different nest of dinosaur eggs. 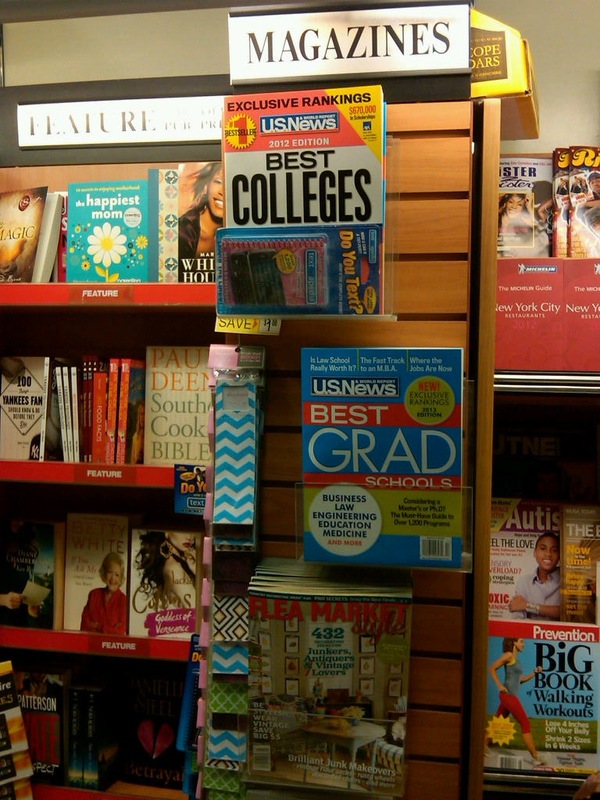 In theory, the consolidation of the newsstand distribution business should have been a good thing for everyone. For publishers, piecing together a print order became much simpler because there are fewer wholesalers of wildly varying sizes and fewer people with wildly different agendas to negotiate with. For wholesalers, the elimination of some nearby competitors and the consolidation of their presence in key regions should have made life easier. It also provided a chance to create firmer relationships with major national retailers. 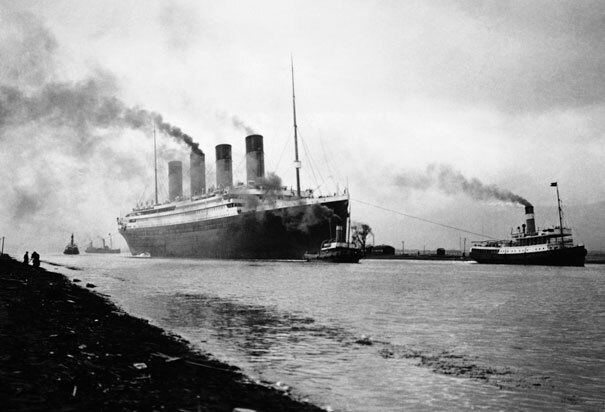 There was the possibility of breaking into new national markets. Retailers were finally able to consolidate their service levels, streamline their invoicing and payments and bring magazine distribution up to levels comparable to their other DSD delivery agents. Some of that happened and whether or not any of it is a good thing most likely depends on which side of the table you sit on. Are you a glass half full or half empty kind of person? What more than fifteen years of consolidation has not done is streamlined how we measure success in our business. All the links in our distribution chain look at it differently. For an SBT retailer, a 35% sell through should be meaningless because they only paid for what they sold and they never carried the other 65% on their books (Although the savvier ones should wonder what could have sold in the space where those returns came from). For a publisher, a 35% sell through can mean a profit if their production costs were not too high. It can also be a break even point. Or it can be a loss. It all depends on those pesky printing and shipping costs. Plus whatever else the wholesalers, retailers and national distributors tack onto the final bill. Those add ons can add up. For a national distributor, selling a magazine at 35% is pretty much the same as a national distributor that sells it at 55% or 15%. For them, the only difference in many cases (Unless the contract is creative and has efficiency tied in) is the volume of sales. A publisher client with a 15% sell through is either on the way out of business, or about to get a lot of hand holding if they still have a stack of cash and the will to fix what is wrong. Hand holding a publisher can be expensive. On the other hand, a lot of hand holding for a +50% client at least means there’s money coming in, and the potential for more. But in the end, what about the reader? After all, our goal here, in this little brackish, increasingly shallow tidal pool of the publishing industry is to sell as many copies of as many magazines as possible. Isn’t it? Is the solution to meld the national distributors (ND’s) and wholesalers together? I’ve heard this idea kicked around. Ideally the goal of the ND’s is to market and advocate for the publishers to the wholesaling and retailing community. If ND’s are not there, who advocates for the publisher? Wholesalers should be invested in the success of the products they market but it often seems as though it’s simpler for them to push a button and say “No” than to dig in and try to understand what is presented to them. To be fair, many on the publishing side still don’t really understand what is involved in wholesaling magazines. And distributing magazines to the newsstand, in spite of all of the technological advances we’ve seen over the last twenty years is still very labor intensive. We don’t see as much local knowledge of the stores and markets serviced as we should expect. 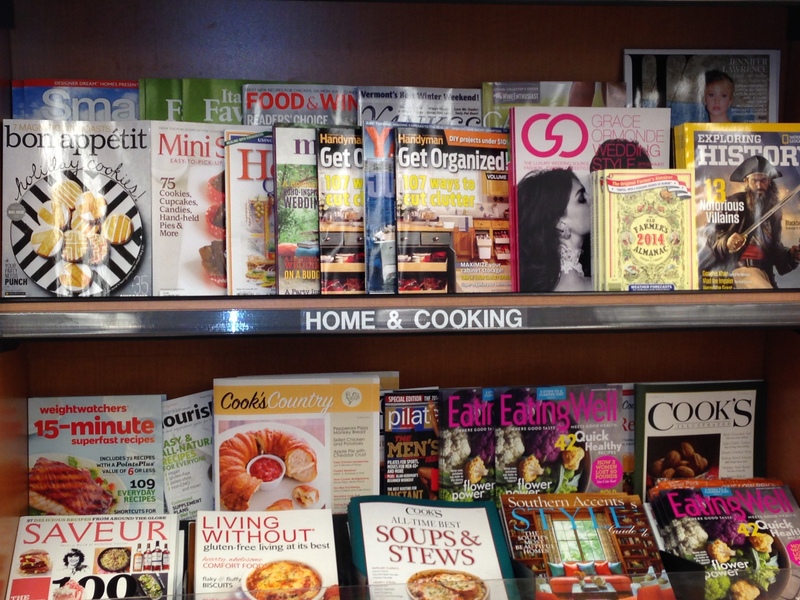 There’s no denying that readers have not been picking up newsstand copies in the quantities that they used to. Sales have been declining for many years. We’ve seen some positive trends like the successful launches of HGTV Magazine and Food Network Magazine. There’s great news on the specialty front as Book A Zines and specials bring in high cover prices and high sales. Mr. Magazine ™, Samir Husni counted 242 regular frequency magazine launches in 2012. At the same time, we have seen the declines in traditionally strong categories as well as the near elimination of some categories that were traditionally industry leaders in the last two decades. These declines wipe out the gains that have been hard won. Maybe we’ve lost our way. In all of our obsessing over consolidating, efficiency, will we or won’t we survive, we’ve forgotten that this is a hand sell, one at a time, get the people into the stores kind of business. There don’t seem to be any short cuts to achieve that end. There are a lot of great tools these days that should make our job more efficient. But we still have to get readers to find the rack, stop in front of the rack, pick up a magazine and then make the decision to buy the magazine. We know people like magazines, we just have to get them to buy them. For those of you who are paying attention, the correct title for this post should actually be “Things Placed in the Book A Zine Pocket”. But let’s not quibble. This submission is from Mark White, the head of Specialty Marketing at US News and World Report. On the plus side, texting and college goes together like chocolate and peanut butter. Over the years, I’ve come across everything from empty candy wrappers to unopened cans of pop and discarded prepackaged seedless grapes in the mainline pockets. So while not shocking, this find certainly is amusing. Don’t forget to keep sending in your photos of “Things Placed in Front of The Magazine Rack.” And while you’re at it, please follow this link to printbuyersinternational.com and check out the recap of Mark’s presentation at the Publishing Business Conference and Expo in New York last month where he discussed how US News broke the “11 Unwritten Rules” of Book A Zine publishing. It’s well worth the side trip. Who knew our industry was so big on oral tradition?